Evolutionary biologists will be forever at a loss to explain how the ordered patterns of beauty in nature can be attributed to random mutations filtered by natural selection. Those without extensive education in biology can see for themselves the impossibility of evolution. Everyone appreciates beauty. Those who are familiar with laws of aesthetics understand that the reason these reef fish are admired by all is because they appear intelligently designed. 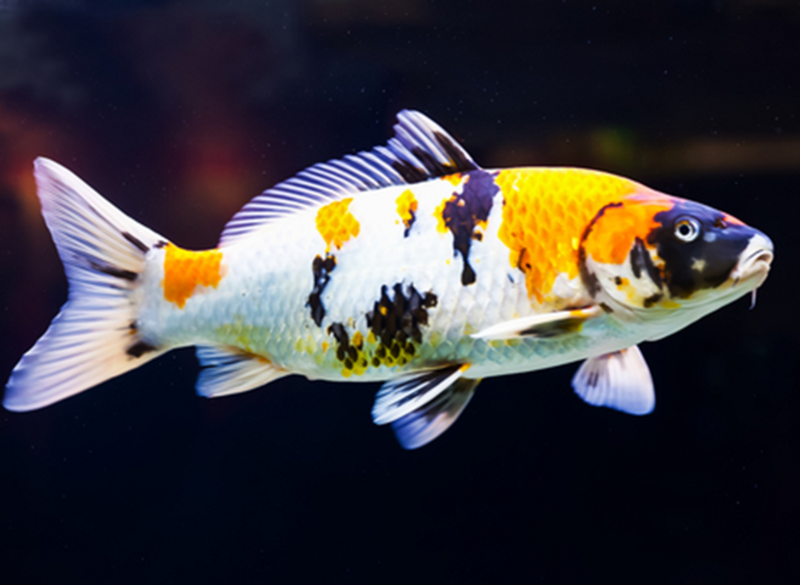 The koi is a carp which has been selectively bred for its vivid coloration. Some specimens have been sold for as much as two million dollars. Despite the fact that skilled breeders have conducted this practice for over 200 years, only more and more examples of random coloration can be achieved. It would be an impossible challenge for a breeder to create a koi specimen with the ordered patterns of color that are seen in nature. This is because digital code (nucleotides of DNA) cannot be randomly shuffled or tweaked to result in anything beyond randomness. Ordered patterns of color require ordered nucleotide sequences. Proponents of evolution have no plausible explanation as to why so many of these creatures are so elaborately ornamented. Generally, the topic of beauty is casually dismissed. 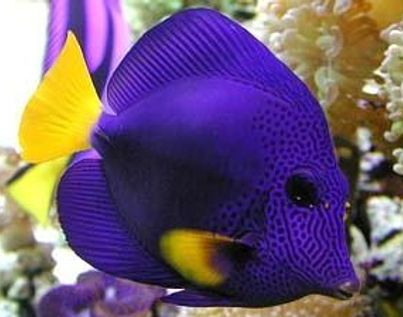 Every time you look at one of these beautiful coral reef fish, you are looking at a testament to intelligent design. artistic intelligent design. Notice the three-colored composite stripe which is perfectly centered on the pupil of the eye. The colors are repeated in the eye itself. A delicate white outline of the fins is artistically offset from the edge, and is repeated in the base of the tail. 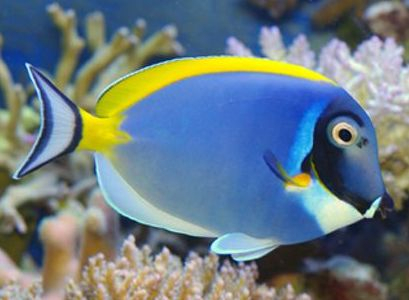 The powder blue tang, an inhabitant of indo-pacific coral reefs, is elaborately ornamented. Notice the tapered stripes outlining the edges of the tail, which are slightly offset from the edges, to result in a thin band of white. Also notice the delicate colored outline of the dorsal fin. 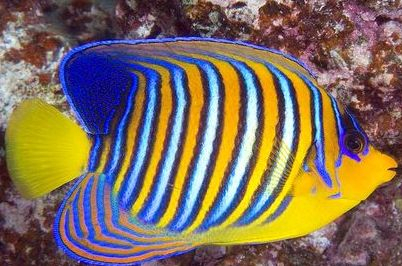 The striking shades of blue and orange, with the ordered patterns of spots and stripes of this surgeonfish provoke feelings of awe and wonder that nature could create something as ornamented as this, for no purpose other than beauty. 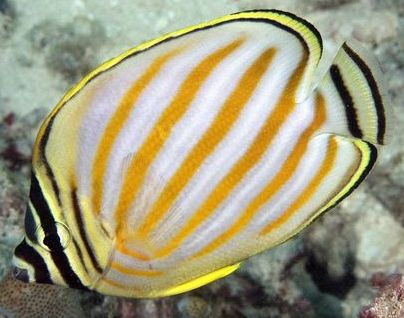 The reticulate butterflyfish is a beautiful example of the non-randomness of the colored patterns of coral reef fishes. The tail has three delicate vertical stripes, along with outlining of the fins. The anterior portion of the eye is yellow, matching the color of the adjacent skin. 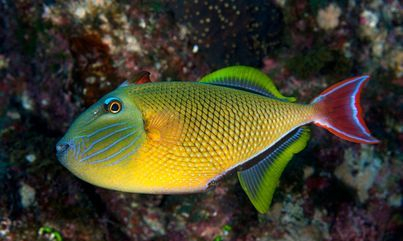 The lipstick surgeonfish has four delicate, color-coordinated outlines of fin, tapered stripes embellishing the tail, and a yellow stripe delineating the colored band between the eyes and mouth. What is the survival purpose of these ordered patterns? 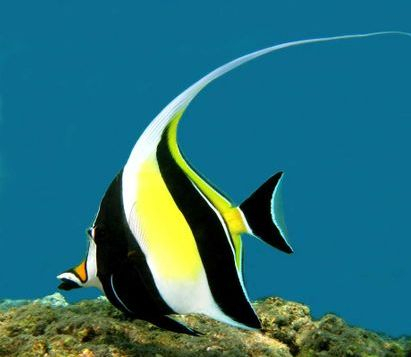 The moorish idol is a common inhabitant of tropical indo-pacific reefs. 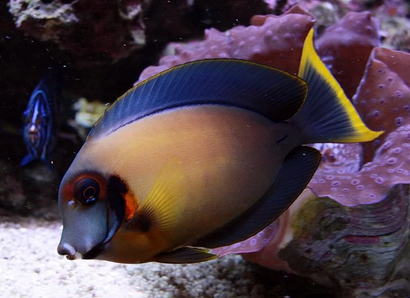 Its colored fin outlines and striking contrast of yellow and black are stunning. 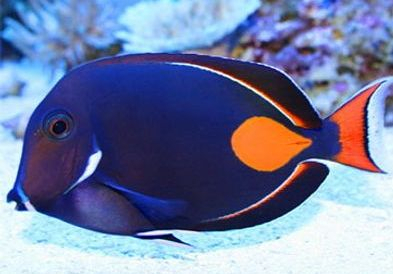 The achilles tang exhibits strikingly tasteful color coordination, in addition to the ordered patterns of design evident in the tail, as well as the outlining of the fins. 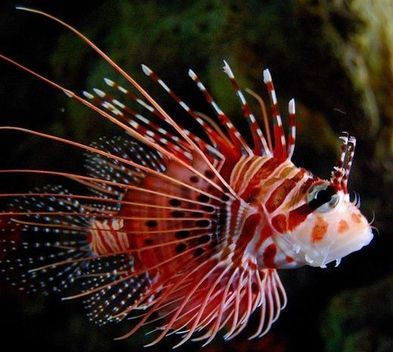 The lionfish is found throughout the tropical south Pacific. Evolutionists believe that its striking appearance warns predators of its poisonous spines. However, this does not explain the elaborate, ordered patterns. 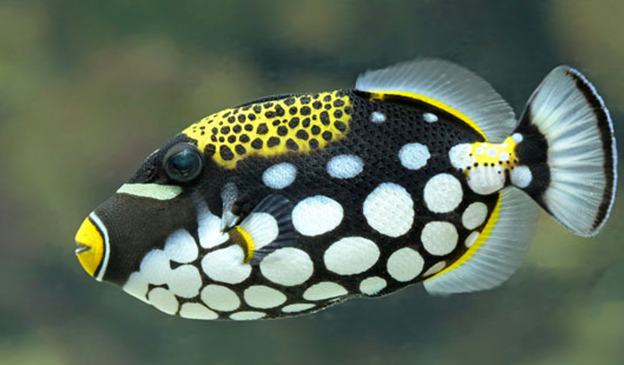 The clown triggerfish is another example of artistic design in nature. While some might regard this as overdone or even tacky, it remains to be explained how and why natural selection would create a delicate, two-striped outline around the mouth, proportionately-spaced spots, and a vertical tail stripe that conforms to the natural contour of the tail. Also note the brilliant yellow stripe at the base of its fins, which delineates the fins from the body. Even if a function can be imagined, this does not justify the belief that random mutations and natural selection can create such a design. 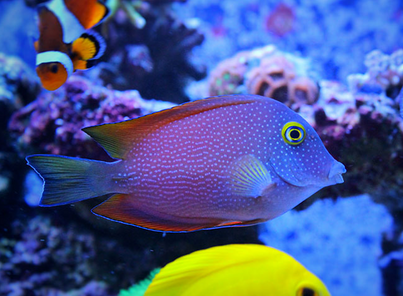 The koran angelfish exhibits striking colors and artistic design. Notice the delicate skin stripes near the eyes, which are repeated in the eyes themselves. 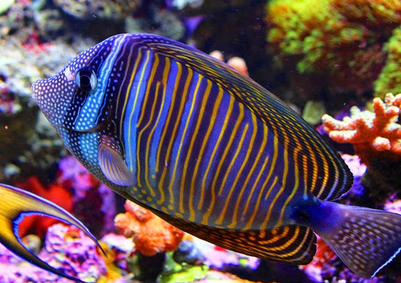 The regal angelfish is endowed with striking composite vertical stripes with tastefully coordinated colors. The fins are outlined in blue, contributing to the overall aesthetics. 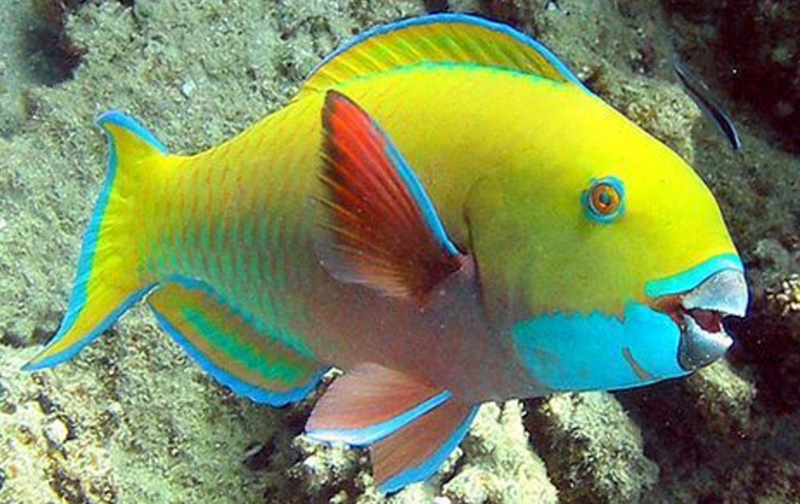 The parrotfish is a common inhabitant of coral reefs worldwide. This species is ornamented with colored outlines of the fins. 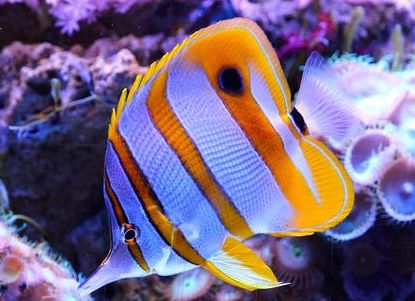 It should be noted that the designs in coral reef fish are seen in multiple unrelated species. 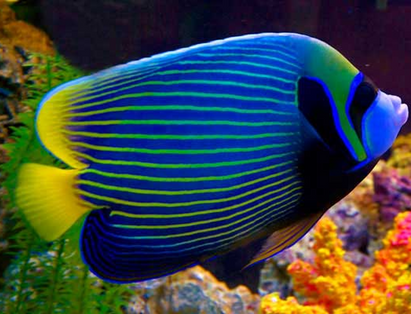 The beauty of the emporer angelfish is due to its artistic design. This is not just due to its brilliant coloration. It is also because of the ordered patterns which add to the aesthetics of the fish. 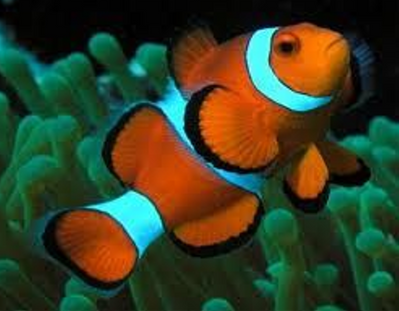 The clown anemone fish is admired because of its striking color patterns, which include black outlined fins and tail, and white stripes bordered by black. 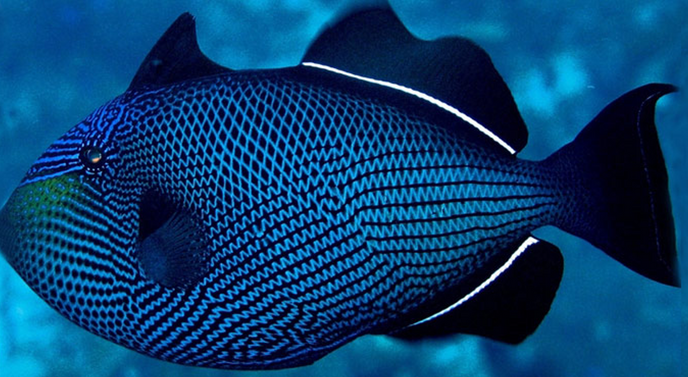 The niger triggerfish is an amazing example of an ordered pattern of skin design. Notice how the delicate skin stripes converge on the pupil... yet another example of order. While some might question the aesthetic taste in this pattern, it is obvious that this could not be the result of random shuffling of nucleotides within DNA. Butterflyfish with colored embellishments of tail and fins. Notice three thin stripes bordering the edges of the fins. 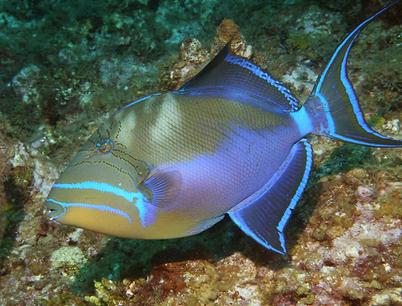 Triggerfish of tropical indo-pacific reef. In addition to the color design of the tail and fins, the scales are deliniated by color. 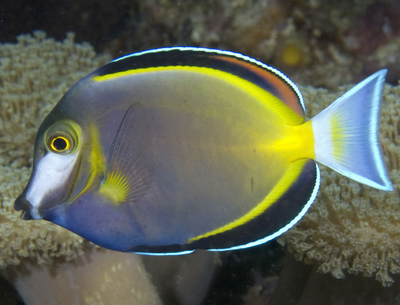 Another species of surgeonfish from an indo-pacific reef. 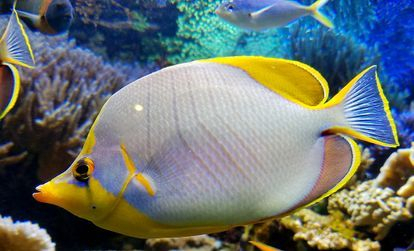 In this beautiful tang, note the evenly-spaced spots, discrete yellow outline of the eye, and very delicate lines of color around the fins and tail. 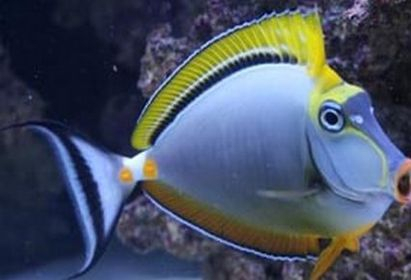 Surgeonfish from indo-pacific reef. Colored contrasting outlines of tail and fins appears purely ornamental. 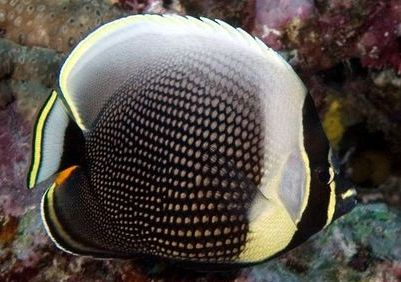 The ornate butterflyfish, when analyzed, shows multiple elements of ordered color embellishment, unattributable to any imagined evolutionary mechanisms. 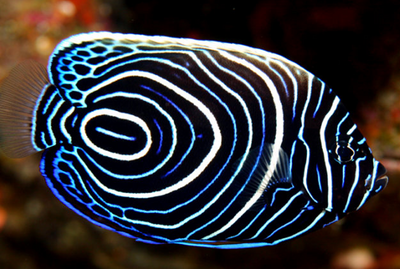 The contrasting brilliant colors, combined with the subtle ordered pattern of the front portion of this sailfin tang results in a stunningly beautiful fish.